I never really thought about my father’s business until recently. Growing up, being constantly surrounded by it never gave me an outsiders perspective of how interesting it really was! So today let me introduce you to KHOZEM GLASS PROCESSING WORKS – named affectionately by my grandfather with its popular tagline ‘The Glass People‘ – just about broad enough to cover all the incredible art glass designing they specialise in. ‘Woah! This is harder than it looks!’… I guess that’s when you know something truly is an ART! That was my first reaction after attending a workshop atSpace118 last weekend and I am sure many others would agree with me on this. It is the kind of art that requires some serious commitment to begin and then to get better and better at it. Many small studios in Lower Parel and Andheri work their skills on screen designs and print thousands of products every day! We too are waiting for the MMT contact cards to come fresh out of press, and so this desire to know how screen printing is even done!!! It is a printing technique that uses a woven meshto support an ink-blocking stencil to receive a desired image. It is arguably the most versatile of all printing processes and often identified with the pop-art works of Marliyn Monroe by artist Andy Warhol who popularised this technique. It was also known as serigraphy in the USA in 1962. 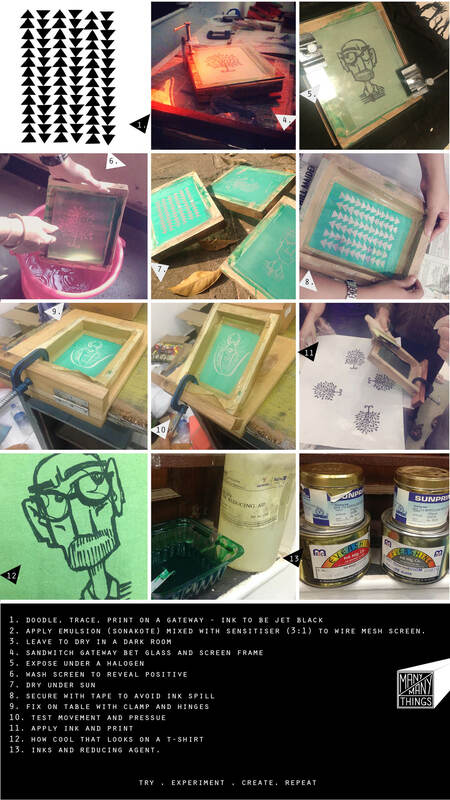 Screen printing is truly a skill every art&craft enthusiast should master! Hopefully this encourages and inspires you to take up the challenge that is screen printing, also do let us know when you succeed and create some beautiful works of art!